Last year Google Shopping started requiring retailers to pay to be included in their results. That affected hundreds of thousands of small to large businesses, which were left having to restructure their online retail budgets and plans. But perhaps the least likely entity to be affected by this change was online merchant Amazon, which happens to be the queen bee of all online merchants. When Google opted to make us all pay, Amazon said no thanks. As a result, your every-day shopper could no longer find Amazon results and Google Shopping results in the same search. They’d have to conduct separate searches, using separate methods. Shopping Enhancer is (was) an extension available for Chrome, Firefox and Safari. What it does (or has done) is simple yet monumental for both merchant and shopper: it brought back Amazon results to Google Shopping. It was no more difficult than installing the extension. From there, so long as Amazon carries the product you’re looking for, you’d find it when you searched inside Google Shopping. At least, Shopping Enhancer once did that. If you were to look on Shopping Enhancer’s website (www.shoppingenhancer.com), you won’t see an explanation of their services. You won’t see a list of testimonials raving about this add-on. No, what you will find is this: “Shopping Enhancer has indefinitely suspended its service. Stay tuned for future product announcements, but we will no longer be able to provide Amazon prices on Google Shopping.” By the time this was actually posted, the site was completely taken down. What began not so long ago as great potential for merchants and buyers is now nothing more than a memory. We haven’t had any responses to our inquiries; however, one can only surmise that Google wasn’t too keen on a system being able to circumvent their Pay-to-Play Shopping structure, least of all from one of the wealthiest online entities out there. Of course, was Amazon directly responsible for the creation of Shopping Enhancer? No, but regardless, the add-on’s purpose was to play Google’s game, without playing by the rules. Sadly, this means that it’s back to status quo. Amazon and Google are like the two bullies at school who can’t get along. They run the hallways. They run the lunchroom. But they can’t get over their own egos. The ones who are left suffering in the end are the web buyers, who only want simplicity in life. 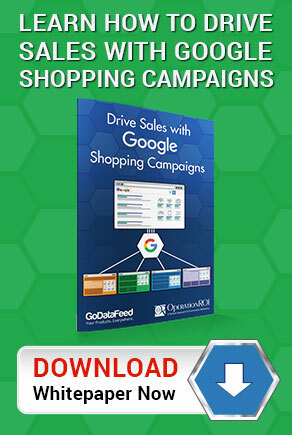 Looking to make the most of your presence on Amazon and Google Shopping? OperationROI can help you develop the best online merchant plan for your organization. Call us at 1-888-277-5429 or fill out our contact form for more information.